Thirty One Outlet Sale is now live! You are here: Home / online shopping / Thirty One Outlet Sale is now live! 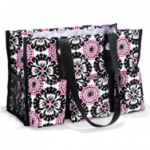 If you love Thirty One, get ready to SHOP! 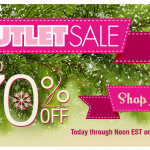 The Thirty One Outlet sale is live for two days only! Starting at 8 a.m. CST on July 18th through 2 a.m. CST on July 20th, you can save up to 70% on Thirty One products! When they had the outlet sale in December, I scored a Large Utility Tote for just $14.99 (regularly $35) and I absolutely LOVE it! It has been great for trips to the pool this summer and I keep it in the back of my van to help organize all of our “gear” as I’m toting kids around town or to throw grocery bags in so it’s easy to carry them inside! One of my friends said this sale is better than Black Friday and I loved that analogy! BE AWARE: Items WILL sell out quickly and the site will run slowly, so be patient! Last time this sale was live, there was a banner on the site, so look for that to access outlet pricing! These images above are some of the deals that were available last time during the sale. I got the Mini Organizers for teacher gifts and filled them with other goodies at the end of the year! They were a big hit! I will update this post with some of the top deals and prices once the sale is live! A little birdie told me that the utility totes will be $15 again! WOO HOO! Have fun and let me know what deals you score! Thirty One Outlet Sale starts TONIGHT! Thirty One Outlet Sale starts TODAY! Thirty One 80% off FLASH SALE! 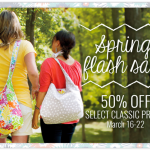 ThirtyOne FLASH SALE: 50% off! I am not seeing anything at those prices, is it only in certain areas? Laura – did you click on the outlet banner at the top of the page? There are great deals out there right now. Plus $8.00 shipping for any amount. I have the brown and black skirt purses and my daughter pretty much took them over since she loves to change out the skirts to them for different looks. Just ordered 5 skirts and a Utility Tote. Wendy – I debated on those purse skirts. They are so cute!